My best tasting Sapphire & Tonic had to be at The Vesper Bar @The Cosmopolitan Hotel. This trendy little lounge sits right on the 1st floor as you walk in the the complex. 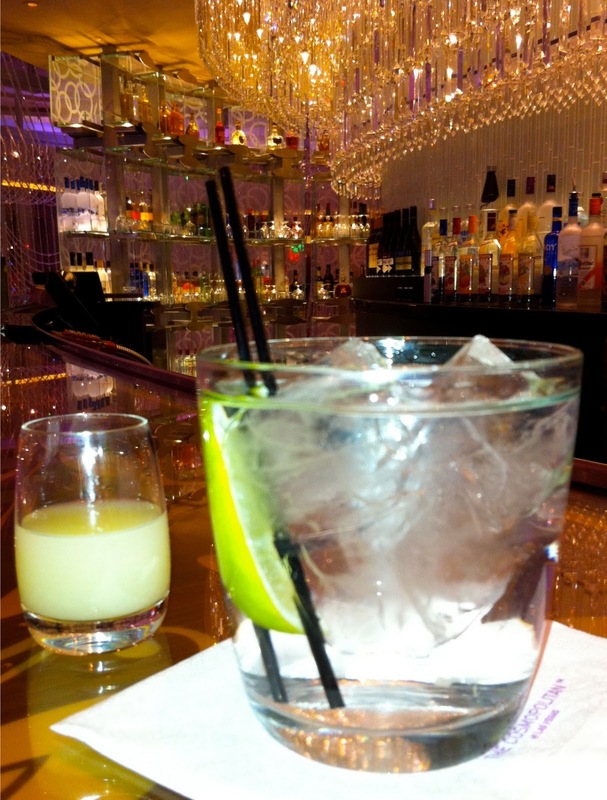 Our mixologist, Jamie used Fever-Tree tonic, Cold Draft ice, fresh lime, & an X-ACT glass. The obvious attention to detail regarding the final presentation was flawless. Most scenic S&T was at the same hotel on the 3rd floor of The Chandelier Bar. The Cocktail was fine and the surrounding sparkle was magical. Also loved the extra shot of Lime Juice! The two non-Sapphire & Tonic notables were the liquid nitrogen passion fruit margarita w/ tequila floater at Fleur in the Mandalay Bay Resort and the salt air margaritas at China Pobano again at The Cosmopolitan. We hit the Fleur for a appetizer tasting as we waited for Red Square to open for the day. It’s really not a good idea to start a cocktail tasting at 11 in the morning- it didn’t end well. We then marched over to molecular gastronomist, Jose Andres’s China Poblano for a quick lunch and were pleasantly surprised with a wonderful Mexican/Chinese sampling complete with our unique margaritas. A must experience.